Leading commercial horticultural suppliers Hort Americas, and smart sensing technology providers 30MHz are pleased to announce that they’ve partnered to bring the power of real-time, crop-level monitoring to growers across Canada, the United States, the Caribbean and Mexico. Hort Americas is the first North American distributor of 30MHz technology. 30MHz provides agribusinesses with everything they need to start monitoring their crops and growing environment accurately and in real-time, with just minutes of setup. Customers choose from a variety of sensors sourced and developed with growers and agricultural research institutions (capturing metrics including VPD, dewpoint, temperature, humidity, soil moisture and airflow.) 30MHz also provides a private, scalable mesh network (with the option to easily add more sensors at any time) and an intuitive analytics platform with real-time alerts, visualizations, heatmaps, charts and graphs accessible on any device. With 30MHz technology, customers can deploy a wireless sensor network themselves, without technical expertise. Sensors arrive preconfigured— customers simply connect their gateway to a power supply and ethernet, and log into the platform to immediately start measuring. Built to help agribusinesses of all sizes harness the full power of their environmental data, the 30MHz platform makes crop metrics accessible, shareable and actionable without the burden of juggling multiple interfaces. Real-time sensor data can be viewed alongside data from other sources, including climate control systems, shelf quality control and traceability monitoring and root zone monitoring software. The scalable and modular nature of 30MHz tech makes it a fit for growers of all sizes across agricultural verticals. With over 150 customers across five continents, 30MHz serves agribusinesses from farm to fork, in greenhouse, vertical (hydroponic and aeroponic), arable, ornamental, cold store, processing, packing, transport, retail and livestock. Based in Bedford, Texas, Hort Americas partners with leading suppliers of commercial horticultural products from around to world in order to serve the North American professional greenhouse and indoor ag grower community with the latest technologically advanced products from around the world. Hort Americas’ breadth of expertise across horticulture makes the company ideally positioned to bring the Dutch-founded 30MHz further into the North American market. “We’ve seen the hunger for actionable data among North American growers— they’re constantly looking to innovate and make the most of their resources. But they don’t have time for overly complex systems that silo their data and take forever to get off the ground. Hort Americas understand the specific challenges and needs of North American agriculture, and how to translate Dutch agri-innovation into efficiency and productivity in local contexts” notes Director of Customer Affairs Cor Jan Holwerda. “Hort Americas continues to look for cutting edge technology that solves problems and provides answers to the questions our grower partners are asking us. With believe that 30MHz’s product portfolio does just that,” adds founder and general manager Chris Higgins. Cultilene, supplier of rockwool-substrate solutions and high-quality diffuse glass, has joined forces with smart sensing technology provider 30MHz to give growers more insights into the root environment of crops. Using real-time sensory data, Cultilene can now offer agronomists an additional tool to optimise their irrigation- and EC management, taking production and crop quality to the next level. The two companies signed the partnership agreement on March 1st 2018. The dashboard, which was designed for ease of use, is currently being tested by a Dutch tomato grower, and will be made available later this year. 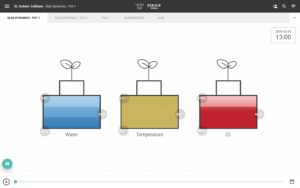 The online dashboard was developed to help Cultilene drive growers’ success beyond offering the best substrate solutions for contemporary horticulture. The company wants to support growers in optimising their growing strategy, and recognizes that maintaining a healthy root environment —which affects water and nutrition absorption— is crucial to this success. Cultilene recommends continuously monitoring five key metrics (“the Big Five”) during cultivation: soil moisture level, EC, pH, oxygen and temperature. This partnership brings together Cultilene’s 35 years of expertise in rootzone management and the real-time data captured by 30MHz wireless sensing technology, augmenting decision-making capabilities for growers. The 30MHz ZENSIE dashboards provides an intuitive way to visualize sensor data alongside other data sources, including climate computers and loggers. Practically, this means that multiple sensors are placed in the roots of plants, and data captured by these sensors is displayed within the ZENSIE dashboard, which growers can access with their smartphones, tablets or laptops. Customers can view heat maps, graphs, visualizations and alerts on changing crop conditions in real-time. Once collected, the grower doesn’t have to analyse crop data. Cultilene’s agricultural expertise is translated into graphs which area available to the customer in the same dashboard. Growers see soil moisture and EC distribution, mat saturation and drain. Crop data is compared with daily target values, much like in Framework (a breeding manual for substrate cultivation). Growers can now connect data from any climate computer to the 30MHzwireless sensor platform with Klimlink. 30MHz, the Amsterdam-based provider of smart sensing technology equips agricultural customers with all the elements needed to monitor and optimise growing and storage environments with physical data: wireless sensors, a scalable network, and a customizable dashboard with alerts and analytics, all deployable in minutes. Partnership and integration with Klimlink offers growers a deeper real-time understanding of crop needs on both macro (climate computer data) and micro (wireless sensor data) levels. The result is tangible insights customers can respond to, preventing crop loss and saving energy. Any systems that generate data can be linked together via Klimlink, and made immediately available in the 30MHz dashboard, with heatmaps, graphs, and other interactive visualizations. “This is a major step in breaking down data silos in agriculture. Growers work with so many different climate systems, and have to read data per system without a central overview of their metrics. This is work-intensive, impractical, and makes it difficult to fully optimise. Integrating with Klimlink knocks down the walls separating this powerful data, making it immediately actionable in our dashboard.” says 30MHz Director of Customer Affairs Cor-Jan Holwerda. Klimlink, developed by agritechnologist Wim van Vliet, enables growers to bring together large amounts of data available from greenhouse horticulture companies (most often from climate computers) onto a single, intuitive platform. Without high costs or subsidies, Klimlink opens the door to many additional applications, making data available for deeper analysis. With customizable data sharing features in the 30MHz dashboard, growers can get more value out of their measurements by comparing data with each other, while researchers and crop advisers can simply look over the grower’s shoulder without having to log on to different control systems. Sercom Regeltechniek BV, a leading developer and manufacturer of high-end climate control computers and 30MHz, a rapidly accelerating provider of smart-sensing technology have recently signed a cooperation agreement to strengthen and improve the real-time remote monitoring and registration of environmental conditions across cold storage and greenhouse contexts. Bringing together the power of climate control systems and wireless sensing technology, Sercom and 30MHz can empower end-users to add real-time sensor checks to their cold store and greenhouse management, and leverage the insights from both systems in a central dashboard. 30MHz provides customers with all the elements needed to deploy a wireless sensor network: sensors, a scalable private network and an analytics dashboard with visualizations and real-time alerts on any device. Quick to deploy without technical experience and based on a subscription model, 30MHz smart sensing technology gives the end-user flexibility in what to monitor and when, how to scale, as well as full control over how to view and share captured data. When accessible in one central location, data from Sercom climate control computers and sensory data captured by 30MHz can provide end-users with the granular insights on environment and crop-level microclimate to better respond to changing conditions, reduce energy usage in heating, cooling, lighting and ventilation, and optimise water usage in irrigation. Users have the option to view data and receive alerts in the 30MHz ZENSIE dashboard, or in Sercom’s SercoVision interface. It is also possible to adapt existing wired sensors, already present at the location, into a wireless version and incorporate data collected into the monitoring system. 30MHz technology has helped customers across cold storage, greenhouse, arable, vertical farming, and processing sectors use up-to-the-minute data on their crops and environments to maximize output, minimize loss and optimise irrigation and energy use. Using a modular approach to sensor monitoring, 30MHz has designed a smart sensing toolkit which scales with the customer’s needs and enables end-users to select the combination of sensors and metrics to fit their objectives. Popular metrics include temperature and humidity, micro-climate, airflow, object counting, light intensity and soil moisture. The company counts agricultural leaders Wageningen University, Proeftuin Zwaagdijk, Royal Brinkman, Rijk Zwaan, Syngenta and Svensson as customers. The partnership between Lisse-based Sercom and Dutch-founded 30MHz, which has its headquarters at the Port of Amsterdam, brings together two key areas of Dutch expertise: sustainable, innovative agriculture and accessible high technology. Together, the two companies can bring the power of data-driven agricultural technology to a global customer base.